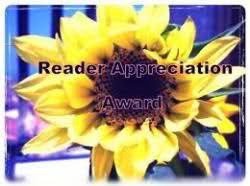 The Reader Appreciation Award is given to writers who have supported other writers' blogs. Happily, I've received the award from Sharla Shults (Blog: Awakenings from Then 'til Now and and Catnip of Life) and Raani York (Blog: Raani York) who I admire for their fine writing and sustained, determined work ethic. Sharla Shults is a poet and writer and has two books out on Amazon Echoes and Remembering. Her third book out this summer is Awakenings from Then 'til Now. Raani York has published articles, letters, short stories, poems, continuation stories and novels (some of which appear on her website). One of her short stories made it to the semi-finalist level in a contest sponsored by the Boroughs Publishing Group. Giving a big HUG to Sharla Shults and Raani York for nominating my blog, The Fat and The Skinny, for this award and providing the occasion to spread the love around online. As a former English teacher and professor, I uplift any opportunity to engage others in reading which some have claimed is a dying "art" in our digital age of short word bursts and flash fiction. CONNECTIONS ON SOCIAL MEDIA SITES. l) Acknowledge the giver of the award and provide a link to his or her blog. 2) Copy and paste the award to your blog. 3) Pass the award on to up to ten bloggers. 4) Notify the selected bloggers that you have nominated them. Thanks again Margo, Amberr, Belinda and Jen. And when you have time, visit each others' blogs and become acquainted. You will be happy you did! Thank you so much for the nomination. I am tickled to death. I am well acquainted with the beautiful Belinda, and now I have other blogs to become acquainted with. Thank you for making the world a brighter place. You are truly one of my favorite people in the blogosphere. What a nice surprise! I will be sure to pass this along on my blog and I will let you know when I do! Thank you for your support Carole. I see from your own blog that spreading love and nurturing others comes very naturally to you. Good to be connected to folks like you! Thanks so much Amberr. You are a constant source of inspiration and I look forward to reading your posts, though I do not always have time to comment. I do promote them, though, whenever I can and know that others enjoy reading and sharing on your expanding network. 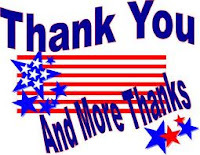 Thanks so much for your kind words. It's a pleasure to share with you. What a wonderful recognition. Well deserved!